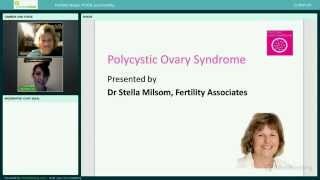 Dr Stella Milsom presented a Webinar on Polycystic Ovary Syndrome and fertility on Wednesday 13 May 2015. Dr Milsom is a leading authority on PCOS in New Zealand and practices medicine at Fertility Associates. She delivered a presentation, which was followed by a question and answer session. The recorded webinar highlights are now available here to watch on video here. Polycystic ovaries (PCO) is the description for ovaries that contain 12 or more follicles per ovary (normally there are 1 or 2 follicles per ovary). The use of polycystic ovary is misleading, as the so-called cysts are small follicles which fail to develop - sometimes known in medical terms as atretic follicles. The diagnosis also assumes that other conditions which mimic this picture, and sometimes are associated with polycystic looking ovaries, have been excluded. Dr Stella Milsom present this Webinar on Polycystic Ovary Syndrome and fertility on Wednesday 13 May 2015. Dr Milsom is a leading authority on PCOS in New Zealand and practices medicine at Fertility Associates. Hey, my name is Claire! I’m 29 and married to Greg who is 33, we have been together for 11 years.